Coffee is basically my guilty pleasure, I love waking up to the smell of it and I love the taste of it, to me there is something so calming and nostalgic about the whole morning coffee ritual. If I'm being honest, sitting on my couch in my sweatpants, sipping a warm cup of (bulletproof) coffee is one of my favourite parts of my entire day (that and bed time but DUH). What I don't love about coffee though is the quick energy burst, sudden crash, jitters, anxiety, brain fog and sugar (or carb) cravings that leave you reaching for a second (or third) cup just to feel "normal". That's where bulletproof coffee comes in.. If you haven't been living under a rock for the last couple of years then I'm sure you've heard of bulletproof coffee and if you haven't heard of it then where the heck have you been?! It's time to get with the (bulletproof) program.. SO WHAT EXACTLY IS BULLETPROOF COFFEE? Bulletproof coffee is essentially a high quality cup of coffee blended with grass fed butter or ghee (obviously skip this if you're vegan) and MCT oil or Brain Octane Oil (made by the Bulletproof brand). I personally don't add grass fed butter to mine because I don't like eating lactose, I will occasionally add grass fed organic ghee (it's lactose free) but that's rare too. If I don't add ghee (which as I said I rarely do) I just add a little extra MCT oil, full fat coconut milk or coconut butter and it basically does the same thing. I also add a splash of unsweetened nut milk, a dash of cinnamon and 1-2 scoops of collagen peptides to my bulletproof for an added boost of clean protein! Bulletproof coffee was designed by Dave Asprey owner of Bulletproof to "supercharge brain function and create effortless fat loss with no cravings" and it does just that! On the Bulletproof website they say that their specific brand of coffee beans and Brain Octane Oil are the highest quality and all that you should ever use and while I don't doubt that their quality is great, I personally don't use their products because they're kind of overpriced if I'm being totally real with you (which I always am) and not available very many places in Canada. I still use high quality ingredients, just not theirs specifically and I have experienced all of the same benefits without actually using the Bulletproof brand of products. Proof that you can keep up with the health trends and be healthy without breaking the bank! 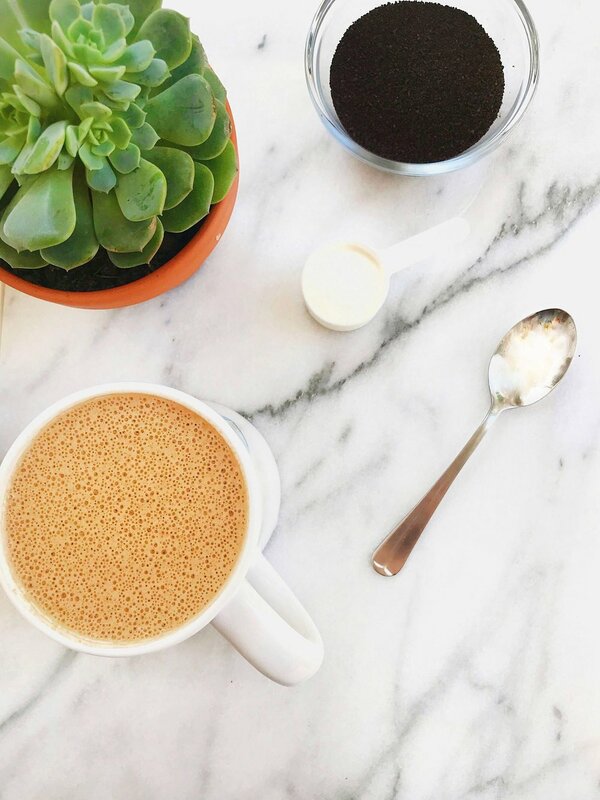 I'm a one cup of coffee per day kind of girl so you better believe that I'm going to get every benefit that I possibly can from that single cup and bulletproof coffee allows me to get everything and more out of my morning cup of caffeine. Steady energy that actually lasts - Saturated fat slows the absorption of caffeine which gives you an even and steady energy boost! Balanced hormones - Fatty acids help to promote hormone production and keeps insulin from spiking (and then dropping) which helps keep hormones balanced. Balanced blood sugar and hunger - Healthy fat satisfies you and balances the hunger hormones ghrelin and CCK - perfect for intermittent fasting! Less cravings - Because of the sustained energy that bulletproof coffee gives, you won't experience any energy or blood sugar crashes which are what actually cause cravings. Mental clarity - MCT oil converts to ketones in the body which are a molecule that the brain uses for energy and prevent blood sugar crashes which cause brain fog. Just like you wouldn't put crappy nutrient depleted food into your body on a daily basis you also want to make sure that you're not pumping your body full of crap when it comes to your morning bulletproof coffee! If you cheap out on your ingredients or don't fully follow the tips that I'm about to tell you then the benefits that you get from the bulletproof coffee probably won't be quite as life changing as what I just listed. The first and most important part is the coffee (duh). That means looking for a coffee that is organic, fair trade and rainforest alliance certified to ensure that you're getting the highest quality possible! The common sugar and (more) coffee cravings that come after a cup of coffee are actually not from the coffee itself but from what is on the coffee during growing, processing and after it's packaged. Conventional coffee beans are one of the most heavily sprayed and fumigated crops in the world, they are also very susceptible to mold and the mycotoxins it produces. If you are buying conventional and low grade coffee you're essentially just paying for beans coated in toxins and mold that promote energy crashes and cravings. Not totally ideal right? Next lets get into the fat.. My favourite bulletproof fat is MCT oil - MCT stands for Medium Chain Triglycerides (MCTs) which are a type of saturated fat that pack a serious health punch. MCTs are beneficial to the gut because they help combat bad bacteria, they are also anti-inflammatory, anti-fungal and anti-bacterial. The caffeine naturally occurring in coffee helps transport the MCTs through the blood/brain barrier to be sent directly to your liver where they have a thermogenic effect, help to raise metabolism and are burned by the body for fuel instead of being stored as fat! Because MCT oil is a fat it is also beneficial in balancing hormone levels, keeps you satiated and balances blood sugar. Coconut oil is one of the best sources of MCTs - around 65 percent of the fatty acids in coconut oil are actually MCTs and the actual MCT oil that you can purchase is basically just a super concentrated coconut oil, so if you're in a pinch you can just add a tablespoon of coconut oil to your bulletproof - it won't provide quite the same amount of MCTs but it will still give you a small dose. PRO TIP: MCT oil has a very quick acting natural laxative effect, so if you've never used MCT oil before it's important to START SLOW (start with 1 tsp and increase by 1 tsp per day working up to 1 tbsp) on your first few servings otherwise you're going to find yourself running to the nearest bathroom as fast as you possibly can (trust me). If you are adding butter or ghee to your bulletproof it's important that you use one that is grass fed and organic! Grass fed butter is higher in butyrate a powerful short chain fatty acid that helps prevent and decrease inflammation, it's also high in omega-3 fatty acids, CLA, beta-carotene, vitamin A, vitamin K, vitamin D, vitamin E, and antioxidants! PRO TIP: You can tell a butter is grass fed because of the bright yellow colour, conventional butter is a dull pale yellow colour because it comes from nutrient depleted, sick cows. As I said before I also like to add Vital Proteins collagen peptides to my bulletproof coffee which is not something that the actual Bulletproof brand promotes but as you guys know I'm not one to follow rules so why start now. Collagen is one of my favourite supplements so I try to add it whenever I can to whatever I can, it helps protect and strengthen the lining of the gut, provides a clean boost of protein that mixes well (unlike protein powder) and makes my bulletproof coffee SO frothy - if you follow me on Instagram you know my obsession with the froth is REAL. If you want to know more about collagen I wrote an entire post on the benefits (read that here)! I also add a splash of unsweetened nut milk because I like more of a latte style coffee and a dash of cinnamon for it's anti-inflammatory benefits and for flavour! PRO TIP: you are NOT supposed to add sweetener of any kind - yes even honey - to your bulletproof because then you're adding a simple carb and cancelling out the blood sugar balancing and fat burning benefits! I also usually like to add a superfood like Maca, Ashwaghanda, Cacao, etc. depending on what mood I'm in! 1. Pour all ingredients in your blender and blend on high for 20-30 seconds, let it sit for 30 seconds to allow the frothy goodness to settle and then pour into your mug and enjoy! I will say that just like everything else in life, bulletproof coffee isn't for everyone (Mike hates it), it's definitely an acquired taste and takes some getting used to for sure, especially if you've spent your entire life drinking regular cups of coffee but it truly is a game changer! If you try my recipe don't forget to use the hashtag #holisticallywholesome on instagram so I can see your recreations and if you found this post helpful please spread the love and share it with your people!